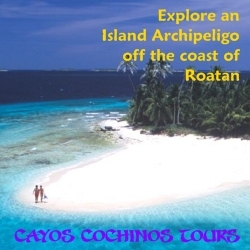 First of all, if you've never been to Roatan you need to remember that Honduras is an extremely poor country and even though Roatan is developing its tourism business and facilities, it is still a long way from having the amenities of someplace like Hawaii. Frankly, that's what we liked about it (and I hope they don't ever let it get too "Hawaii-like." Having said that...this review is made in the context of life on Roatan. Casa Mermaidia is a beautiful home with an incredible view and unique access to the community pool. It in a quiet location, but just a 5-10 minute walk over the hill to West Beach and all the action. It is on the windy side of the island, and since we were there during windy season we had no problems with mosquitos. There were a few bugs (typical of any island in the tropics), like ants and a couple of island roaches...but all in all pretty bug free. Roatanlife manages the property and they were wonderful (thanks Mike and Liz!). As is the case with any house this close to the ocean, it is beginning to have a few "aging issues" like a leaky roof, the electronic panel on the dishwasher quitting, the screen doors not staying shut, and the clothes dryer not shutting off when the door opens, but the folks at Roatanlife are right there to address any concerns. Roatan is a quirky place....power and/or water can go out at random times and it's slow to get things fixed, but people are very nice and if you just go with the flow it's a great place. 2 of the bedrooms have queen beds and the other 2 have doubles...all of them have decks and all but one have air conditioning. The one without air conditioning also has no closet....but was comfortable with the breeze blowing through the open windows. Wouldn't necessarily recommend it on a non-breezy night though....it's hot in Honduras! If you need a 4 bedroom home....we would highly recommend this one, we loved it!